Get out your red and green yarn and crochet an adorable elf this season! This little guy is perfect for getting you into the holiday spirit. When using worsted weight yarn he measures about 8 inches tall, and uses only a small amount of yarn in each colour – you can create enough elves to fill an entire workshop! This elf amigurumi pattern includes detailed instructions and step-by-step photos, plus you can contact me along the way to ask any questions. It is an intermediate level pattern because the body is crocheted in joined rounds. If you have never used joined rounds in amigurumi before, I recommend checking out the tutorials on my website (photo and video) for joined rounds before purchasing the pattern to see if you are comfortable with the technique, or if it something you would like to learn. You can make Felix using continuous rounds if you prefer, but his legs may be less even and the colour changes won’t be as clean. 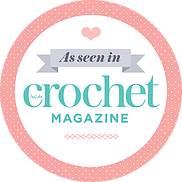 The pattern also involves starting with a magic ring, single crochet, chain and slip stitches, increasing, decreasing, attaching pieces, and working through both loops and back loop only.